While Congressman Tim Walz may be seen as the frontrunner for Minnesota’s DFL gubernatorial nomination – and perhaps the party’s most strategic pick for electoral success in 2018 – his candidacy is distinct from the ever-growing DFL field for being the only candidate who doesn’t work in St. Paul and one of two without any experience serving in elected state office (along with St. Paul Mayor Chris Coleman). Four of Walz’s opponents will have a combined 56 years in elected state office in 2018: Paul Thissen with 16 years in the state House, Rebecca Otto with two years in the House and 12 years as state auditor, Tina Liebling with 14 years in the House, and Erin Murphy with 12 years in the House. With plenty of time for other candidates to jump in the race in advance of next year’s June 1st state convention in Rochester, the 2018 field already has the third most experience in elected state office in Democratic/DFL history dating back to the first gubernatorial primary in 1912. And that number could rise. Two other long-serving DFLers have not yet ruled out 2018 bids: Attorney General Lori Swanson and State Senator Tom Bakk. If both of these officeholders run, the field would boast 92 years of collective state elected office experience on their resumes – second most in party history. Five of these candidates would drop out after the state convention. The only other cycle with more statewide experience for the DFL than the current 2018 field was in 1998 featuring the infamous ‘my three sons’ of Minnesota political royalty: Skip Humphrey (son of U.S. Senator and Vice-President Hubert), Mike Freeman (son of Governor Orville), and Ted Mondale (son of U.S. Senator and Vice-President Walter). Humphrey, the eventual nominee, brought with him 26 years of service in state elected office as attorney general (16) and state senator (10) while Freeman (8) and Mondale (6) were both ex-state senators. Add to that tally the 40 years of service by state legislators Doug Johnson (28) and John Marty (12) plus Dayton’s four years as auditor and the 1998 DFL field brought 84 years to the table. The governorship has increasingly become an attractive electoral option for DFL officeholders in St. Paul in recent years with the party recording each of its Top 5 most experienced fields on this dimension during the last six cycles since 1998: 114 years of service for candidates in 2010, 84 years in 1998, 56 years (and counting) in 2018, 52 years in 2002, and 40 years in 2006. 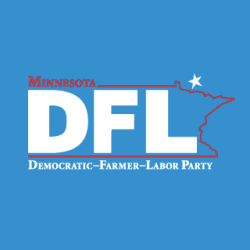 [The number dipped in 2014 because, for the first time since 1990, there was a DFL incumbent on the ballot and Dayton had just eight years of service to elected state office in St. Paul to his name]. 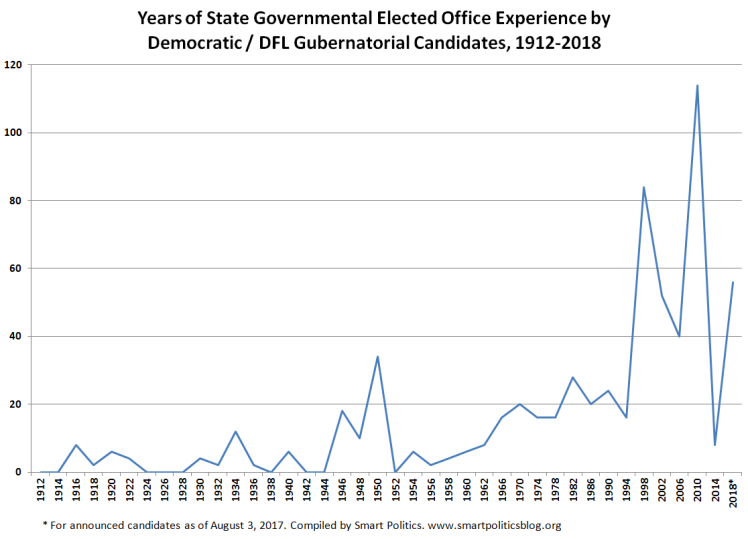 Due in part to the Democratic (and, as of the 1944 merger, DFL) Party not enjoying much electoral success until the second half of the 20th Century, gubernatorial candidates averaged only 5.2 years of state governmental elected service for the party from the first state primary in 1912 through 1962. Since 1962, that number has increased seven-fold to 36.4 years. The only cycle that saw Democratic or DFL gubernatorial candidates with a wealth of experience in elected office in St. Paul prior to the mid-1960s was in 1950. That cycle featured former attorney general (1933-1936) and Supreme Court Justice (1936-1950) Harry Peterson, former state representative (1931-1934), lieutenant governor (1935-1936) and governor (1936-1937) Hjalmar Petersen, and former state representative Charlie Halsted (1937-1946). The trio had served for 34 years collectively. Peterson, who resigned from the Court to run for governor, won his party’s nomination but lost the general election to Governor Luther Youngdahl. If Attorney General Swanson enters the 2018 race, it will be the first time in the primary era that two sitting Democrats in constitutional offices will simultaneously vie for their party’s gubernatorial nomination. Be the first to comment on "The St. Paul-Heavy 2018 DFL Gubernatorial Field in Historical Perspective"